Leeds United chief executive Ben Mansford moved last night to reassure supporters that the club remained in talks with transfer targets and were confident of adding players to their squad before the start of the Championship season. United’s attempts to build on six summer signings have failed to produce a result since the sale of Lewis Cook to Bournemouth three weeks ago but Mansford said he was hopeful that certain deals would “move forward” in the days before Leeds and head coach Garry Monk begin the new season at Queens Park Rangers next weekend. “Garry knows where he’d like to go and he’s got support to add players to complement the group,” Mansford told the YEP. “They’re identified, we’re in talks with them and I hope they land. “If they don’t then we’ll move forward and we’ll get there but even now, with the league a week from kicking off, there are still a lot of clubs looking like they’ve got lots of business to do. 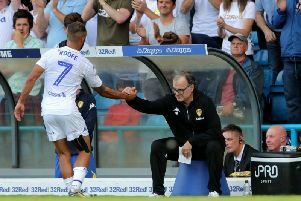 Leeds have been searching for a new centre-back for the past month and the club remain in negotiations about the proposed signing of Sunderland midfielder Liam Bridcutt. Bridcutt’s successful loan at Elland Road last season prompted Leeds to seek a permanent deal this summer but Sunderland are holding out for a seven-figure fee in an effort to cover the cost of paying up the last year of Bridcutt’s £26,000-a-week deal. “I’d not like to comment on players who are under contract at another club,” Mansford said. “It frustrates me to see players getting unsettled so it’s difficult for me to talk about Bridcutt. “But Garry knows where he wants to go with the last two or three bits of the jigsaw. He’s got a shortlist now of a small number of players he wants to bring in that he thinks will make us competitive, that he’s excited about. “He’s challenging us to only bring in players who are better. We’ve got to be sensible and only add the players who Garry thinks will make the team stronger and suit the system he wants to play. “I’d love to be announcing a wonderful signing every day but in a very competitive market you’ve got to jockey for position and at times it’s a game of poker. Monk, who wants to secure cover at full-back, turned down the option of signing Fleetwood Town right-back Conor McLaughlin and free agent Reece Wabara last week, telling the club that neither transfer would significantly enhance his squad. The 37-year-old is currently looking at another alternative, 32-year-old Gabriele Perico. The Italian right-back, who played for Cagliari while Cellino was owner there and recently left Serie B club Cesena, is on trial at Elland Road and played in an Under-21 match at Farsley on Wednesday night. He is expected to feature in tomorrow’s first-team friendly against Atalanta. “I think what you have to accept is that the owner (Cellino) has his set of contacts and Garry has his set of contacts and ideas,” Mansford said. “I worked hard at Barnsley with a remit to recruit players under 25, players who have their better years ahead of them. So we pool those different resources. “Here we’ve got an opportunity to bring someone in, especially to a young group, who has over 100 Serie A games behind him,” Mansford said. “He’s played 50, 60 games in the last two years so therefore it makes sense to look at someone like that.